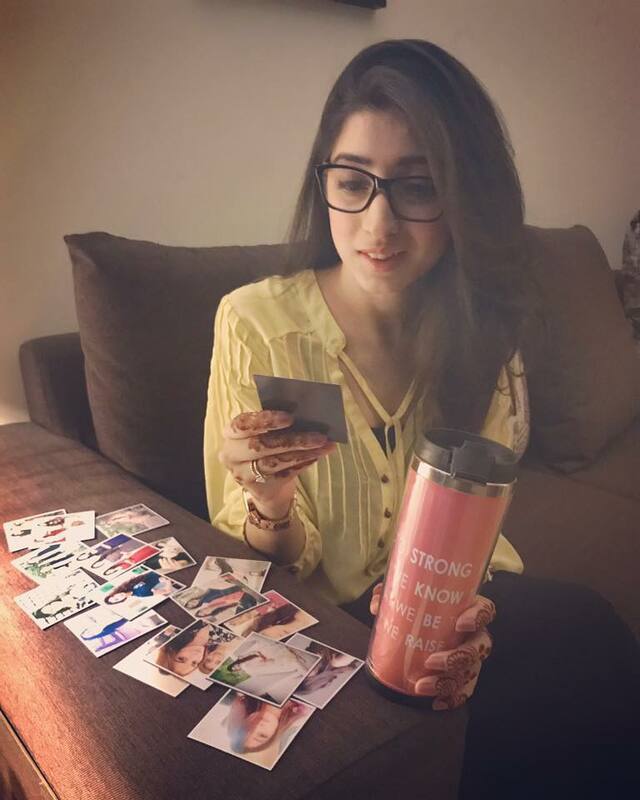 Mariyam Nafees is an actor known for her impactful roles. You might remember Khajista of Yakeen Ka Safar, a girl married to a much older, abusive man. 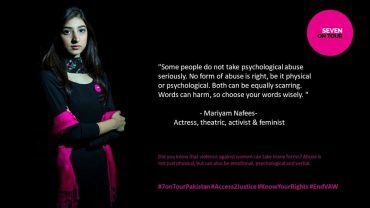 She raised awareness about domestic abuse and child marriage in Pakistan through her character. This is not the first time Mariyam chose a role that depicts the harsh realities of the society and claims to continuing to do so. We interviewed Mariyam to get an insight into her amazing feminist mind. You are one of those celebrities who are very vocal about the political discourse in the country. Why is that? https://www.instagram.com/p/Bd0VQ0shSRQ/embed/captioned/?cr=1&v=8&wp=658#%7B%22ci%22%3A0%2C%22os%22%3A3311.9000000006054%7DI’m a firm believer in the fact that people should be politically aware. Awareness is important! We shouldn’t be just following the masses but should also have an opinion of our own. We should know about our rights, about who is capable to run our country because that affects us and our future immensely. On the current political scenario, things are getting exciting because of the coming up general elections. I want to request the readers to please go out and vote, but before that research, evaluate, observe and see who you want to vote for, doesn’t matter who you vote for as long as your conscience agrees and also because you owe that vote to your country. You are an open feminist. Tell us why is feminism important in Pakistan and especially in the media industry? Feminism is important not just in Pakistan but all around the world. Women everywhere are fighting for their rights and trying to prove themselves. It’s important and about time that the society gives us our due place and respect. Feminism is fighting for equality; economically, politically and socially. The media industry is notorious for being a male-dominated industry where women are paid less than men, where we’re constantly portrayed as damsels in distress and when it comes to showing powerful women, men often end up opting out of the project. I know a few men who take a stand on this but even today, in 2018, there’s a stigma attached to the word ‘feminist’. I really hope everybody soon understands what a real feminist is, because truly it’s not a bad thing, actually it is something all of us should be. Period. It is obvious that you are choosy about your roles. What is it that you look for in the characters you play on screen? I look for substance. I like characters that are close to reality, the ones that are meaningful, leave an impact on the audiences and give them a solid message. I just choose my projects wisely, because quality over quantity matters to me. If I believe in a character, I do it; if I’m not convinced by the script then I let it go. Do you think, being a feminist and an actor, you have a greater responsibility to do better roles? How does it affect your role selection? https://www.instagram.com/p/Ba9H86nBJCK/embed/captioned/?cr=1&v=8&wp=658#%7B%22ci%22%3A1%2C%22os%22%3A3318.500000000313%7DYes. I do think that I have a huge responsibility and if you look at the roles that I’ve portrayed, I’ve tried to raise awareness with them in whatever capacity I’m given. It plays a huge part while I’m selecting my roles because I feel by being on TV, I’m just not being watched by women but men as well. And, if I can make just the tiniest bit of difference in their lives then I feel my job has been done. Tell us about your project with UN Women and why did you do it? UN approached ‘Women through Film’ founded by my friend who is a great director; Madeeha Raza. She asked me to collaborate with them and to take up that project. I do feel glad to be associated with the short film because of its message, something that people don’t really consider a big deal – psychological abuse. Psychological wounds hardly ever heal, after years and years, the misbehavior is a constant trauma for the victims. So, through that short film, we tried to convey the message that chronic misbehavior is a part of the domestic abuse and in a marriage, it should not be accepted whether you’re a housewife or a working woman, stand up for yourself and don’t let your spouse mistreat you. How important is women empowerment for you and how do you wish to spread the wave in the country? Every day I see so many women struggling with their lives. Be it personal or professional, life is a constant battle for them. Me, being someone who has always been able to voice my opinions, had the liberty to make my own choices but at one point even I had to go through a tough time trying to stand up for herself; hence I believe it’s important that every woman is empowered. In my line of work, millions of people watch me on-screen so, by selecting the role of an empowered woman helps convey the message. Apart from being vocal about politics, I’m also vocal about women empowerment and human rights on my social media platforms and talks. I will continue to stand up and fight for these issues at every chance I get. How do you want to help the women of Pakistan and What message would you like to give to all the females of the country? I want to and I will help them in every capacity that I can but most of all by raising awareness and in helping to provide education for girls across the country. You’re strong, you’re beautiful and you’re capable of doing wonderful things so don’t let anything or anybody hold you back. Have the courage to stand up for yourself and the women around you. Believe in yourself to do the unbelievable! What role will we see you in next? https://www.instagram.com/p/BedWY23Bhgy/embed/captioned/?cr=1&v=8&wp=658#%7B%22ci%22%3A2%2C%22os%22%3A3325.8999999998196%7DCurrently, I’m shooting for a play directed by Mehreen Jabbar where I’m portraying this girl who is being forced to leave her job and get married. It’s a very interesting character, very much like me, something that I haven’t done on-screen before and I’m sure a lot of girls are going to relate to this character. I hope the audience likes it and gets the message that we’re trying to convey through the character. What advice would you like to give to young aspiring models and actors? Any cautions? There is absolutely no harm in becoming an actor or a model, if you really want to become one then go for it, just remember to never compromise on your moral values and you’ll be fine. Being a feminist and that too in a patriarchal society like Pakistan is literally an uphill task. Despite all these negative connotations that have come to be part of this feminism tag; women will have to understand that it is their movement and they should come forward to own it and make use of it. Only then they will be able to reclaim what is righfully theirs.Way to go girls.